Does your company have any passageways or areas that regularly need to be closed to pedestrians? 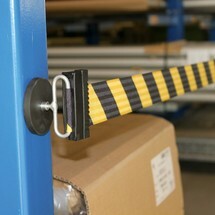 Then what you need is a permanently installed barrier belt with a magnetic end piece, which can be deployed at short notice. 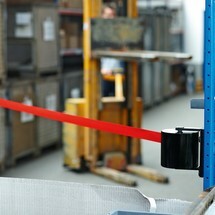 The wall clip for wall belts is suitable for connection. It accommodates a Wall Mount barrier wall belt to save space. When this is stretched out, large areas can be marked off, for example to guide people at airport check-in counters and in departure lounges.